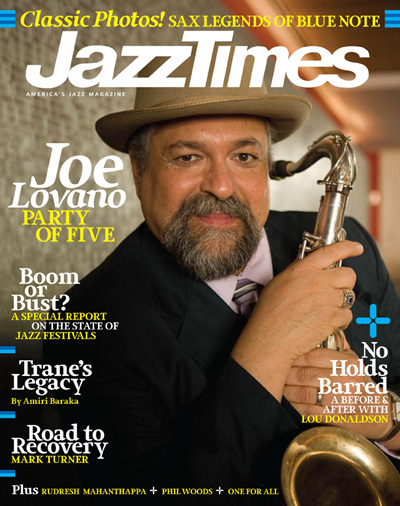 Nice surprise waiting for me at home yesterday afternoon – a copy of Jazz Times was delivered in the mail, with none other than my man Joe Lovano on the cover. The magazine had ceased production earlier this year and at the time there was much mourning and chin-scratching in the jazz blogosphere about the financial viability of small-interest publications in these times. Some were a little sniffy about the mag and the direction it was going in, but I have always loved it, not least for their trinity of regular columnists, Gary Giddens, Nate Chinen, and the incomparable Nat Hentoff. Call me a Luddite, but much as I surf the net for jazz nuggets, there’s nothing quite like sitting down with a magazine and reading the thing cover to cover. So, welcome back, we’re pleased to see you. Do us all a favor, and hang around, would you?